Sweet Potatoes are some of the most nutritious vegetables and have been found to have significant anti oxidant properties.This is also an excellent source of vitamin A in the form of beta carotene, good source of vitamin C, manganese, good source of copper, dietary fiber, iron and potassium.Since sweet potatoes are very rich in beta carotene and vitamin C and vitamin B complex, they are also excellent immunity boosters.Sweet Potatoes are also said to be beneficial in stabilizing blood sugar levels. Place the peeled and cubed sweet potatoes in a microwave safe dish and cook on high in the microwave for a couple of minutes or until soft. Mix the sweet potatoes once or twice while it is getting cooked. Cool slightly and mash until soft and pulpy and keep aside. In a large bowl mix together whole wheat flour and all other spices and salt. Add the mashed sweet potatoes to this and knead into a soft dough. Keep the dough covered for at least 30 minutes. Divide the dough into even lemon sized balls. Using flour for dusting roll them out evenly as thin as you like. Heat a griddle/ flat pan and place the rolled out dough and cook for a few minutes till it small spots begin to appear and then flip it over and cook the other side too until brown little spots appear on the other side. Nice one .. Will Surely try..
Hey, nice idea of using sweet potato !! need to try !! Dey look yum !! i have been seeing this roti in a few blogs off late. i would want to try it tooo.. looks yummy. i love sweet potato. tastes yummy when made as a side for rice. 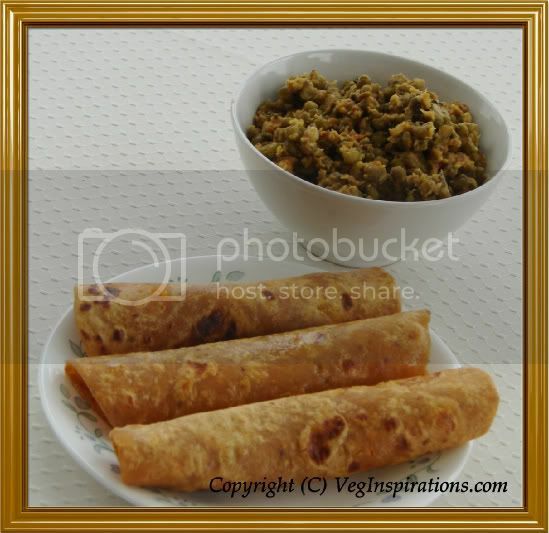 Rotis stuffed with sweet potatoes sounds great...Nice recipe Usha. I made this too from a magazine, but I see that yours is a savoury version. Mine was sweet. Good one, Usha! Usha,jus seen the same rotis in some other blog..anyways,no doubt that its a nutritious roti that can be eaten happily by kids too..I think thats the relevance of this roti compared with any others. Hi Usha, happy New Year. Sorry, couldn't visit buddy bloggers for long time. Sweet potato in a roti is really new to me. Looks like a yummy recipe. Will try it soon..
looks yummy..love it..I make this for my son..have one in my blog..
Wow! I love making my own flatbreads and my whole family loves sweet potato! I can't wait to give these a try, they look and sound fabulous! This recipe is completely new to me ...nice yaar ...will try it out one day .. Anything sweet, both of us are a mile away! We didn't like the sweetness of this veggie too! I should have a spicy and sweet flavor ur roti! I love this, it is ages ago i had them. I think it must have been before i got married and that would make it atleast 18 years ago. Thats a wonderful idea! Will give it a try. Looks delicious! I was little hesitant to try sweet potatoes in parota for their sweet flavor! But your recipe is tempting me to try it once. Looks so mouth-watering Usha. Hi dear, am back :-) adding sweet potatoes into rotis is such a cool idea! Happy New Year to all at home. Usha, this is a wonderful recipe. Thanks for posting it! I usually stuff the sweet potato into the paratha, much like aloo paratha, but mixing it into the flour is a great idea. I have never tried this, looks interesting. This looks divine to me, Usha! I wonder if I could make it with my gluten free blend and get such excellent results. I will have to try it soon. Thanks for inspiring me! Ah, how I love it when we trick our husbands. That is one of my favorite moments. Totally new idea to me and gotta try it. This is such a fantastic creative recipe! I make parathas with all things under the sky & never thot of sweet potato! Thank u so much for sharing this. Anything with sweet potato in it is a done deal for me. This looks crazy delicious! This has got to be my favourite stuffed parathas.